The Rockingham Meetinghouse was begun in 1787, dedicated in 1800. I had done some preliminary analysis of the design and frame and realized I needed to see it. I wondered if it would feel as spare as the Rocky Hill and Sandown meetinghouses. The site, on top of a hill with a view all around, makes up for the simplicity of the structure. One can only come to it from below, and like many 18th c. New England buildings it sits upright and confident. It is very impressive. I will go back in the summer, when it is open and I can go in. The Town Fathers specified a building 44 ft. by 56 ft. 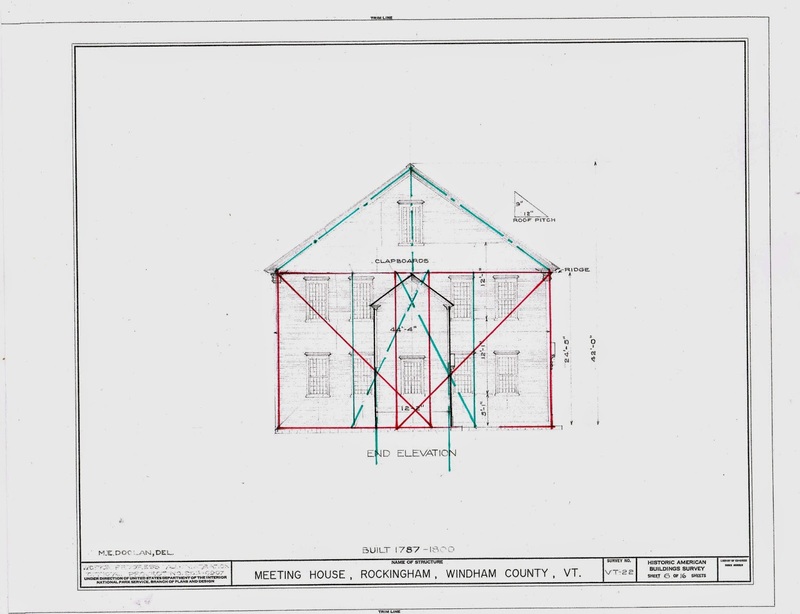 The HABS drawings read 44'-4" x 56'-6". The difference could easily be the addition of the sheathing and siding to the frame. The porches (the end staircases) are square: 12'-2" x 12'-2". The difference could also be that the rule General Fuller had and the one we use today differ (1/19). As an architect I like think of General Fuller, the master builder - who in 1785 was also the architect - considering what would visually, spatially make the statement. I think of him mulling over the open space in the middle with the pulpit centered on one wall, a window behind, the balcony on the other 3 sides. He laid out the square which defined the open space in the center and then divided that square into thirds to set the columns for the balcony and the posts for the frame. See the black square and columns. He extended the column spacing - the dotted black lines - to place the posts on the front and rear walls. Then the diagonals of the square were extended, creating 2 overlapping squares. This made the balcony the same depth all the around. See red square 'a-a-a-a' and green square 'b-b-b-b' both with diagonals. The porches are squares set in the middle of the west and east walls. See the small green square on left. I may be romanticizing: he was building in the tradition of Sandown and Rocky Hill. Like those meeting houses, the plan is made up of 2 crossed squares. The width, spec'ed by the Town, was divided in thirds, the squares overlapped. However when I tried to draw it from the large squares to the central one nothing quite lined up and there were so many lines it was confusing. It could not have been any easier on a framing floor. I think once he laid out the thirds, he concentrated on the central square. The front elevation follows the same proportions - the square divided into thirds. The arrows point to where the diagonals cross, the center lines of the windows. The porches' widths are half the square. The only deviation is the center bay which is a 3-4-5 triangle. 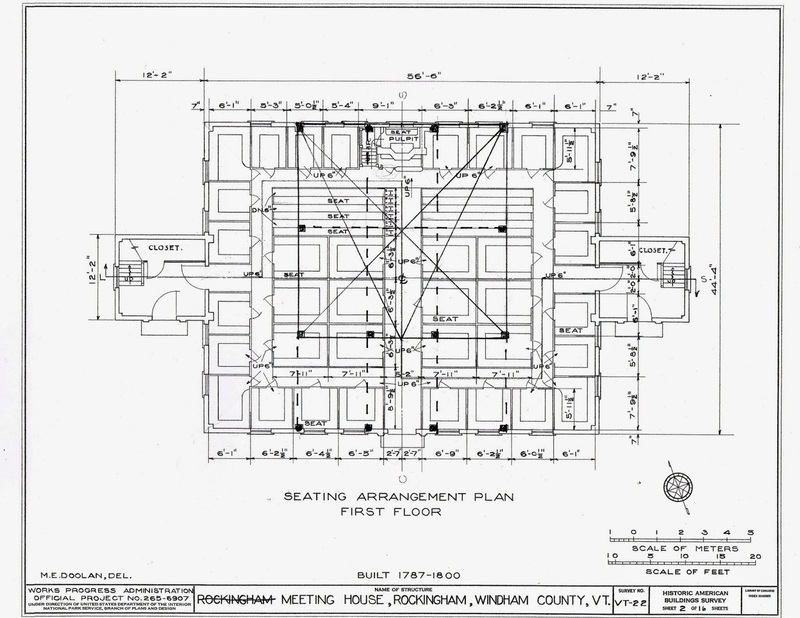 Some of the HABS prints for the Rockingham Meeting house are very faint. The main floor plan, the interior section which shows the roof trusses, the end elevation which I reproduce here, are very hard to read. I have outlined the shape. I think the roof is 3-4-5 triangles back to back, shown in green. The drawing says a 9/12 pitch - the little triangle to the right of the roof. A 9/12 pitch is 37*. A 3-4-5 triangle is 36.5*. 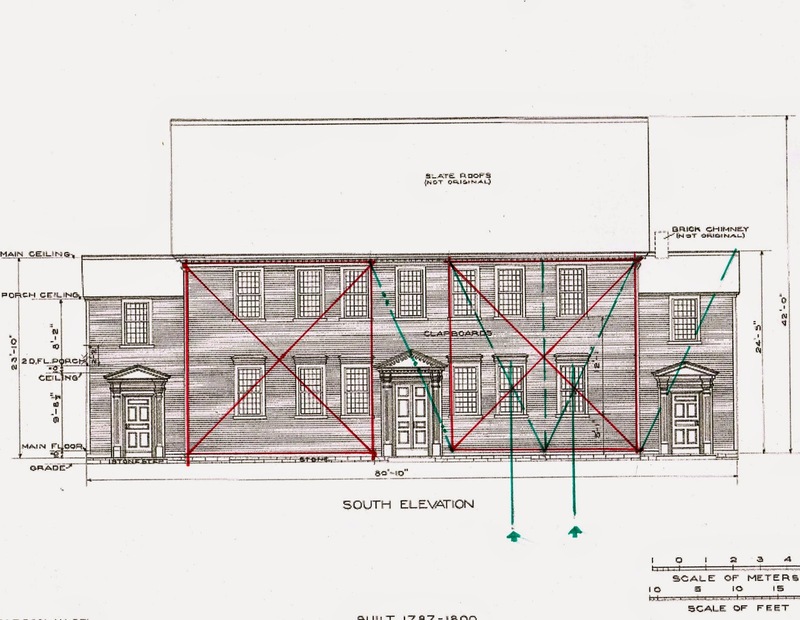 I would like to read the original dimensions taken on site. I think it is probable that the delineator was not aware of the use of geometry. The side view shows squares begun from each corner, crossing, both divided into thirds. At the third of each is the wall for the porch. B) the square made up of 3 rectangles. D) the square made up of 3 rectangles. 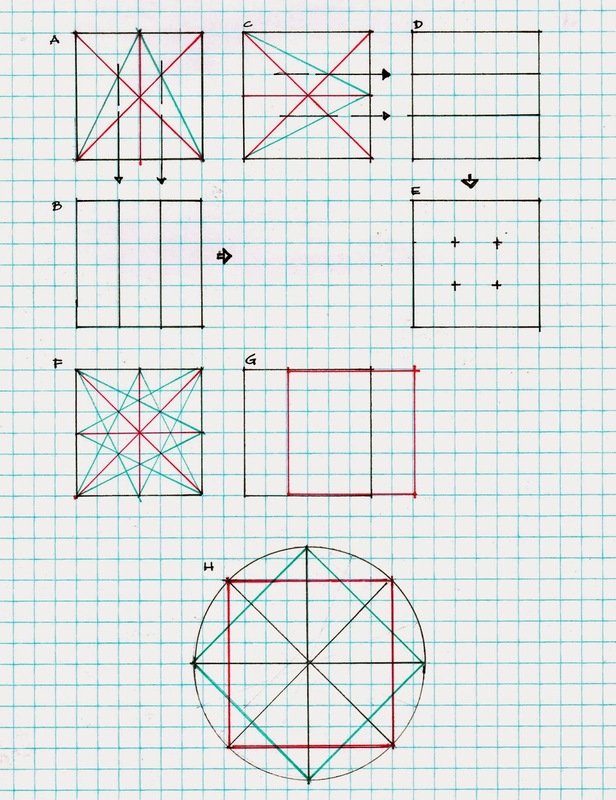 E) with only the intersections noted. F) is the square with all the lines generated from A and B.
G) is the 2 squares crossed. I will leave it up to you to imagine the confusion of lines resulting. H) is the diagram for the doors. 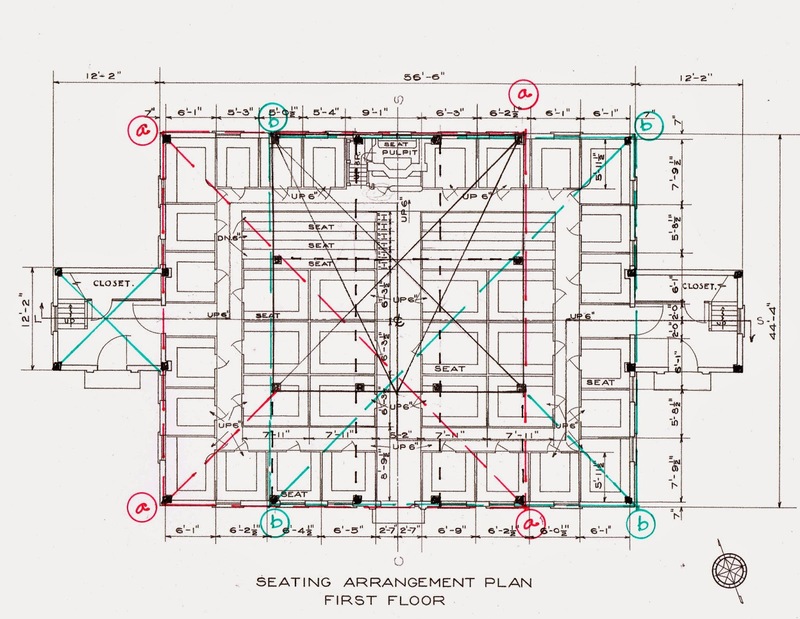 Since I have not seen any use of a circle in the plan or elevations I am hesitant to think that the door dimensions were governed by a circle. However, the joiner may not have been the master builder, and may have used a different system. Or the square was simply turned 45*. Here is the side door. Its height and center line are the determining dimensions. From that comes the square and its diagonals, its thirds. The crossing points determine the center lines of the pilasters, the height and width of the door, the width of the architrave. Now add the square turned 45*. For this I have used the main door. I have drawn in only the green 'star'. 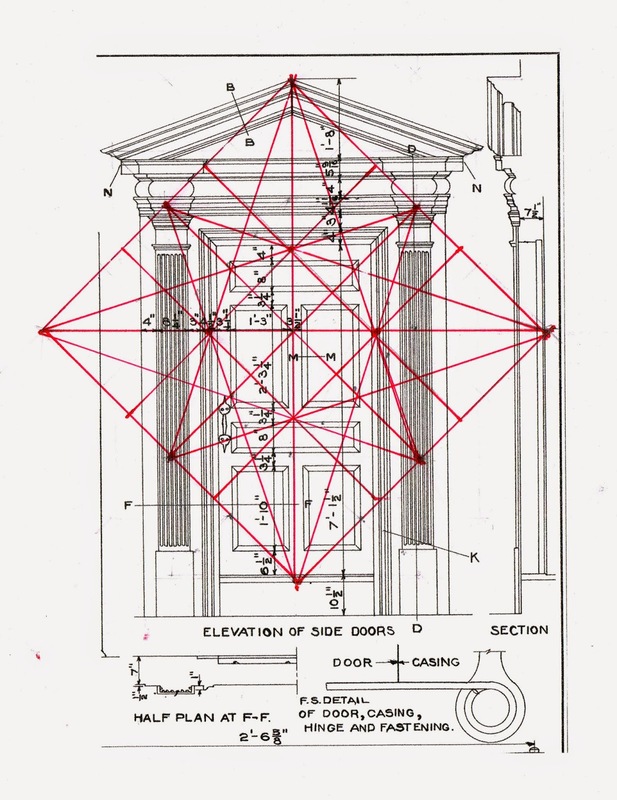 If you look back at the front elevation the peak of the pediment is in the center - that dimension determined the height of the entrance, threshold to pediment. I have added dots at some of the important intersections. If I add the red star other dimensions like the width of the moldings, the door panels are found. 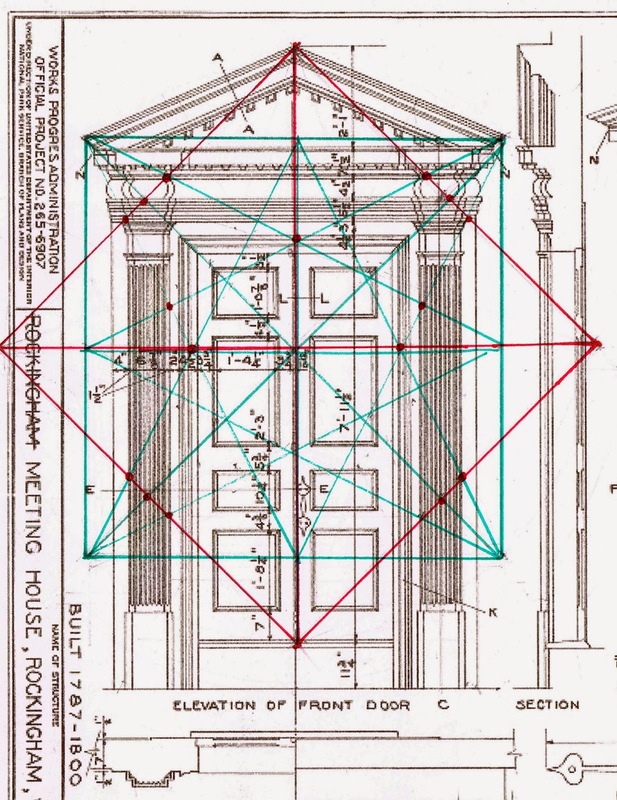 If a circle is drawn around the squares, the arc defines the bases for the pilasters. Last picture: Just as at the Rocky Hill Meeting House the eaves on the porches bump into the windows. Neither master builder had solved that problem.